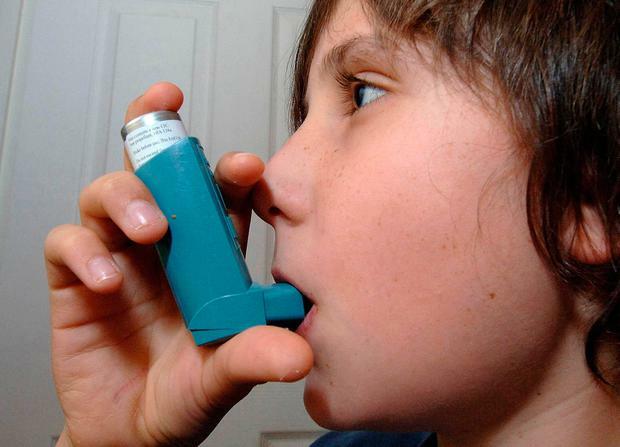 The obesity epidemic may be fuelling the rise in childhood asthma, a study suggests. Researchers in the US discovered that obese youngsters were 30pc more likely to develop the lung condition than children of a healthy weight, while being overweight raised the risk by 17pc. The team at Duke University in North Carolina studied the medical records of 500,000 children as they visited the doctor between 2009 and 2015, a total of 19 million appointments. The results suggest that one in 10 asthma cases is linked to weight gain. If the findings were replicated in Britain - where 1.1 million under 18s have asthma - it would mean more than 100,000 children might have avoided the illness if they were a healthy size. Although previous research has suggested that children with asthma are more likely to be obese because they are unable to exercise, the authors of the new study said it now seemed that the weight itself was driving the condition. "I think it's reasonable to be concerned that it's a causal relationship," said Dr Jason Lang, associate professor of paediatrics at Duke and the study's lead author. "It appears becoming overweight or obese as a child significantly increases your risk of developing asthma, and it's a significant increase, directing attention again to the importance of preventing obesity at an early age. "Obesity may be the only risk factor for childhood asthma that could be preventable. "This is another piece of evidence that keeping kids active and at a healthy weight is important." It is thought that too much weight stops the lungs expanding properly, causing people to take smaller, shallower breaths which can aggravate the airways. It may also trigger inflammation in the body which can spark asthma attacks. Approximately one in 11 children suffers from asthma in the UK and across all ages roughly 1,410 people die from the condition each year. "Paediatric asthma is among the most prevalent childhood conditions and comes at a high cost to patients, families and the greater health system," said chief scientific officer Dr Terri Finkel, of Nemours Children's Hospital in Orlando, who participated in the study. "There are few preventable risk factors to reduce the incidence of asthma. "But our data show that reducing the onset of childhood obesity could significantly lower the public health burden of asthma. "Addressing childhood obesity should be a priority to help improve the quality of life of children and help reduce paediatric asthma."